With a growing number of autograph-heavy prospect prospects from Panini and Leaf, not to mention several other Bowman products offering more ink, 2014 Bowman Chrome Baseball includes a major shift. Hobby boxes now promise two autographs for the first time. The long-time brand also includes several new twists and inserts in an attempt to freshen things up. The 2014 Bowman Chrome Baseball base set features 220 cards. This breaks down to 50 rookies and 170 veterans. Ten Rookie Variations come with an alternate photo. They're also numbered to 99, which helps identifying them. Another 100 Prospect Cards are in the set, carrying on from where 2014 Bowman Baseball left off. Both base and Prospect cards have several parallels: Refractors (#/500), Blue Refractors (#/250), Purple Refractors (#/150), Bubbles Refractors (#/99), Green Refractors (#/75), Gold Refractors (#/50), Carbon Fiber Refractors (#/25), Red Refractors (#/5), Printing Plates and Superfractors (1/1). Chrome Prospect Autographs and Rookie Autographs are all signed on-card. Basic Refractors are numbered to 500. Like the base and Prospect parallels, there are lots of other signed Refractor types as well: Blue (#/150), Bubbles (#/99), Green (#/75), Gold (#/50), Carbon Fiber (#/25), Purple Bubbles (#/10), Red (#/5), Printing Plates and Superfractors (1/1). There are also Twitter-Blue Social Media-Graph Refractors (#/10) that include an inscribed Twitter handle. Super prospect, Kris Bryant, has a couple of different autographs in 2014 Bowman Chrome Baseball, however, the circumstances are unique. His Chrome Prospect Autograph that was included in 2014 Bowman Baseball is inserted here as well. Also, more of the 2013 Bowman Chrome Draft Kris Bryant autographs can be found, including color Refractors. Black Wave Refractor and Silver Wave Refractor Hot Packs are randomly inserted, replacing four base cards. Silver Wave Refractors are numbered to 10. Mini Chrome cards return with a checklist that includes both veterans and prospects. These come with a handful of parallels: Die-Cut (#/150), Die-Cut Blue Wave (#/99), Die-Cut Black Wave (#/25, jumbo packs only), Die-Cut Red Wave (#/5, hobby packs only - not jumbo) and Superfractor Die-Cut (1/1). Autographed Mini Chrome cards are numbered to 10. Fire Die-Cut Refractor inserts are designed in a way that they're meant to give off the appearance they've been melted in a fire. Besides base versions there are Atomic Refractors (#/99), X-Fractors (#/25) and Superfractors (1/1). 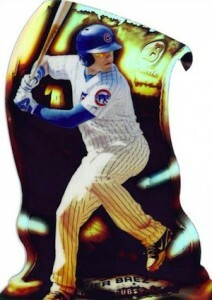 Collectors can also find Refractor Autographs (#/25) and one-of-one Superfractor Autographs. Dualling Die-Cut Refractors round out the basic insert lineup for cards exclusive 2014 Bowman Chrome Baseball. Featuring two players, these have three levels of numbered Refractors limited to 99 or less. The 1989 Bowman is Back Silver Refractor continuity insert set that's running throughout all 2014 Bowman sets continues.Parallels include Black Diamond Refractor Autographs (#/15) and Super Jumbo Refractors (#/10). Bowman Black Autographs carry over from other Bowman-brand releases. Exclusive to hobby and jumbo packs, these distinct autographs are numbered to 25. Violet parallels are numbered to 25. AFLAC and Under Armour All-American Autographs continue, delivering early autographs from today's prospects that were signed while they were in high school. 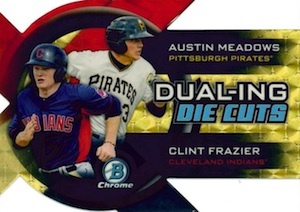 Another change that some may overlook is that 2014 Bowman Chrome Baseball is aiming to go deeper into stats, further adding to the prospecting nature of the set. Topps is working with Bloomberg Sports in this regard. (3)Rhys Hoskins 2014 Bowman Chrome Refractor Lot. Black Green Blue. All 3 Mint!! 170 cards. Shop for base sets on eBay. 100 cards. Shop for sets on eBay. 73 cards. Click here for a detailed guide to the set and signers. Kris Bryant autographs are in the set. However, they're the same card that was originally included in 2014 Bowman Baseball. Because of this, he is not listed on the checklist below. Here's an article on the card. Good: Two autographs per box, new Refractors that stress patterns over color, Fire Die-Cut inserts make a theme out of the unusual shape rather than being seemingly random, visual stats on the back. Bad: Weak autograph checklist, double-dipping on the Kris Bryant autograph from 2014 Bowman, base set numbering will cause confusion over the long-term. The Bottom Line: Almost every year, Bowman Chrome is in a bit of a tough spot. It’s out too early for new draft picks and it’s too late to hold back key players from last year’s draft. Understandably, the checklist suffers. Sure, there will invariably be a couple of players that emerge, but there is a lot that won’t. The addition of a second autograph is something that’s long overdue. But it has come at the price of a checklist that has almost doubled in size. For team collectors, that’s good but for the casual prospector, it probably won’t mean much. It’s also nice to see that there’s an attempt to make basic inserts more compelling and fun. This year’s Bowman base design is clean. The small shift in the logo opens things up a little more for the photo. The borders have a somewhat modern feel to them. All in all, it works. It would be nice to see etching return to help the images pop, particularly on the Refractors. It’s used in Topps Chrome so I’m not sure why it isn’t with Bowman Chrome. There are some nice tweaks here as well. While there’s no shortage of parallels, the new ones are shifting more towards patterns rather than strictly colors. Also, inserts like Fire Die-Cut bring with them some personality beyond the parallels and autographs. The on-card autographs are something of a given, but it’s still worth appreciating. It’s a big part of what makes the cards the modern key for virtually every prospect. This is something that should never change. One of the coolest things about 2014 Bowman Chrome are the backs. They debut some advanced visual stats that dig a little deeper into player performance. Given how hobby prospecting is all about gathering info and tracking trends, this is a perfect place to try it out in. Hopefully this becomes a regular feature not only in Bowman but other sets as well. Bowman Chrome is stuck between the early-season Bowman and end-of-the-year Bowman Draft. It’s a tricky spot as far as prospects go. Most of the latest top picks usually make their debut in Draft. The trend over the last couple years has been to hold back a couple to anchor Bowman the following year. So what about Bowman Chrome? It’s pretty much leftovers and guys who couldn’t make the cut in either other spot. Sure, a couple might break through a few years down the line, but there are also tons of autographs from aging prospects and late picks who will be aging prospects in a couple years. The bolstered quantity of autographs is appealing in some regards. But now you’re sifting through more than 70 prospects. So even though you’re getting more autographs, the quality isn’t there to match. It’s not necessarily the set’s fault because that’s the way it is. And will continue to be unless the three focal Bowman releases keep with the status quo. My biggest pet peeve with 2014 Bowman Chrome is the numbering. It’s hard enough to figure out and calculate whether the base Chrome Prospects come from Bowman or Bowman Chrome. In the past, numbering has been continuous so a little thinking and counting and you can figure it out. Now Chrome Prospects in both 2014 Bowman and 2014 Bowman Chrome are not only numbered separately but with the same prefix. So unless you have a checklist handy (you’ve come to the right place), you might have a tricky time knowing which product the card came from. The numbering can start from scratch between sets but there needs to be an indicator as to what collection they’re from. Panini and Upper Deck have this at the bottom of all their cards now. 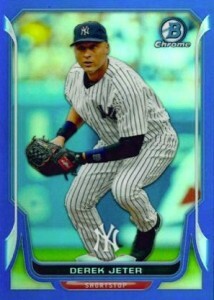 With so many sets on the market now, it’d be nice to see Topps follow suit. The Kris Bryant situation is something that I don’t think should have happened. It was a card that was part of 2014 Bowman. Call me a traditionalist, but no card, no matter how great, should be included as-is in two separate releases. Yes, rereleasing it does make the product more exciting, but it sets up the possibility that the concept could be revisited in the future. I’m not big on keeping track of what things are “worth.” But it is a factor. Cards are too expensive today. As a collectible this needs to be considered and if a card is going to be put in multiple sets, it’s best if it’s announced in advance. On the positive side, the basic inserts feel, on a whole, more compelling than 2014 Bowman. The Fire Die-Cuts are my favorite by far. The biggest reason a lot of collectors bust Bowman Chrome is for the autographs. As mentioned, it’s all about quantity over quality. Thankfully, this isn’t the priciest box on the market either. It’s cheap enough that one can take a moderate long-term risk to see if a player pans out. I enjoy revisiting my Bowman cards every few months to see how the players I have are progressing, if at all. The more varied inserts and different parallels help when you don’t get a great autograph. However, I did feel like there weren’t enough Refractors. Despite there being so many levels, I got all of two parallels, both of which were the most common types. With Panini pushing the color big-time in their Prizm sets to good success, maybe it’s time for Bowman to follow a similar pattern. I like to take a long-term approach with Bowman stuff. It’s not so much about today but rather 2015 and 2016 when I’m digging through my random monster boxes to see if any players have made an impact in the big leagues. I can’t say that about a lot of sets that are often boxed up and only flipped through when I’m looking for something else and get sidetracked. The advanced stats add a lot of fun to 2014 Bowman Chrome too. It’s interesting not only to study the numbers but to look at them in a different way. On a lot of levels, this is an enjoyable set. However, for a product that relies on a checklist of strong prospects, it was tough to pull off. I think this points more to an issue with scheduling and products competing with each other internally more than anything else. 2014 Bowman Chrome might have a weak checklist, but it also shows a lot more creativity than it has in a long time. 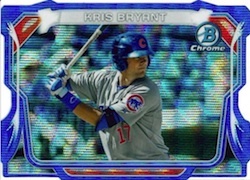 Does the 2014 Bowman Chrome Kris Bryant Autograph Set a Dangerous Precedent? The majority of autographs will be prospects. A list hasn’t been released yet. Isaac � I don’t believe they’ve been announced. 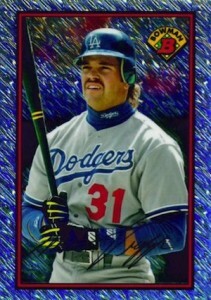 They might be but, at this point, Topps would be the best place to ask until it arrives. Is there news on how many Rookie autos and Prospect autos there will be per box (like for jumbo: 2 Rookie and 3 prospect per box)? Do you think they will be using the same numbering of players as they did with 2014 bowman, or will they be reissuing the same cards with different numbers?? so I pulled a social media auto out of retail its chris kohler I was just wanting to know how rare are these? Always love the Bowman Chrome, but as a Rangers fan I counted a total of 9 cards including inserts for my team. I’ll pass. It’s Bowman Chrome so you pretty much know what you are getting. Disappointed there aren’t more Bryant autos in the set, but Abreu makes it attractive. Also, Ryan I don’t see any difference between a short print prospect card I got compared to the regular base card other than the PS number. Do you know of any variation to the card or is it just the numbering? Matt � I haven’t seen of the variations yet. This year has “errors” too so it might be one of those. Love Bowman Chrome products for baseball but would be convenient to not have the same name Bowman Chrome as the parallels in the regular bowman set. I have to figure out the card number to look it up correctly on Ebay and it would be nice if the base cards for chrome looked a little more different than regular Bowman. We pay a lot for this. I feel like they could afford to switch it up a bit more. I retract my prior statement. Just bought a couple packs. Wow the back of these cards are so cool. Homerun spray charts, batting average split in the 4 quadrants of the strike zone, and some cool inserts. This is different and finally some info on the back of the card that is unique and informative. Awesome product. I’ve been checking out some of the listings on eBay. And there appears to be some kind of confusion as to what the newly released carbon fiber refractors are really supposed to refer to: there’s one type that features diagonal lines and is numbered to 10; and another that features horizontal lines and is numbered to 35. Either way, both refractor variations appear to be listed as “carbon fiber” by their respective sellers. So you might want to check this out as well if you care about revising your set checklist information regarding this particular product. Ron � The Carbon Fiber (diagonal lines) is the one numbered to 10. The other card with fuzzier horizontal lines looks to be the Black Static Refractors, numbered to 35. Cameron � Looks like they are the Black Static Refractor Autographs. This product design was bland in the nicest way of putting it! the inserts were horrible! I bought two jumbo boxes and I think I got 4 refractors in each box! all the cards where of average photos for the cards. It’s like they are in a hurry to get this product out and it failed miserably! I got five autographs in each box total, eBay value for your dollar on each of them they’re horrible. The draft picks are of player never even heard of and to try to get popular player or even a star player is out of the question. I think I got two out of each jumbo box total waste of money! If topps keeps this up i am going to panini!!!! Mike � Yes, but it’s the same Chrome Prospect Autograph from 2014 Bowman. Also, more 2013 Bowman Chrome Draft Autographs are in here too including color Refractors. Upon breaking a jumbo box my response is, overall, extremely favorable! I pulled a couple of extremely limited autos /50, /10, and an Austin Wilson AFLAC Auto from 2009, which caused me to do a double-take. Twice. (That’s 4 “looks” for those counting at home). The on-card autos set Bowman apart, even from “Inception,” which still doesn’t receive the love and 2ndry market attention it deserves. Also, pulling the Kris Bryant auto…which was what I was REALLY after made my $160 LHS purchased box a winner. If I were to file a complaint, it would be that the addition of even more colored refractors only serves to water down the market as opposed to buoying it. That, however, is a minor complaint. 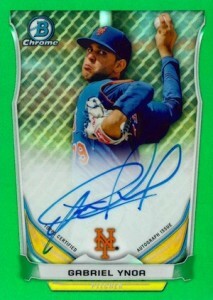 The checklist is extensive, but Bowman usually does a solid job of vetting the athletes with autos in the product. Lastly, the re-imagined card backs, with zone charts, really enhance the experience for Prospect collectors and “chromies;” I MUCH rather have a handle on Scouts’ opinions on the respective players’ tools as opposed to his favorite movie or who he idolized as a High Schooler. Very solid investment with 5 autos and a more enjoyable break! when/are they releasing Retail blaster boxes? Always a fan of Chrome, Ryan your checklist misses Mini Chrome Die-Cut Yellow Wave /50. The prospect error cards are numbered with “PEC-**” for ease. 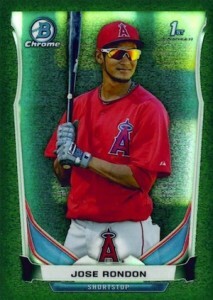 Additionally, the error on PEC-YG (Yimi Garcia) is that he is listed as 1’6″ tall. So…. No retail Blaster boxes? Overproduced, too many names on checklist, not enough top prospects. Only hope is to chase wrongly placed Kris Bryants or hope to hit a Urias Auto. why are there two different bcp25 and others? beckett doesnt price the others? am I looking in the wrong spot? JRock � 2014 Bowman and Bowman Chrome both start their Chrome Prospects at BCP1 which has led to the duplicate numbers. In previous years, the checklists complimented each other and it was easier to tell which was from which release. The easiest way is probably the style on the back. If I remember correctly off the top of my head, Chrome cards from 2014 Bowman had traditional stats on the back. Bowman Chrome and Bowman Draft have enhanced, visual stats. 2014 BOWMAN CHROME BASEBALL FACTORY SEALED HOBBY BOX (2 AUTOS PER BOX)! BRYANT?